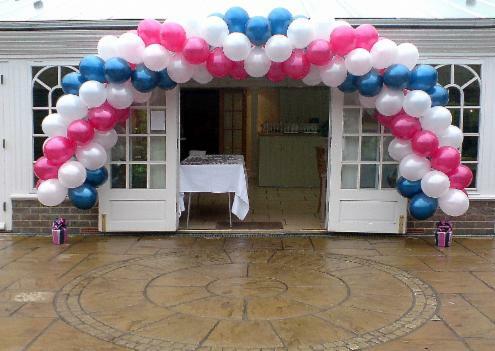 Balloon arches are often used to frame entrances and doorways, providing maximum impact when guests arrive. They are also used to good effect behind Top Tables, and over DJs, or Stages. We offer two different types of arch, String of Pearl Arches, and Swirl Arches. These can be provided in a wide variety of colours and prints. We inflate ALL of our helium filled balloons on site at your venue, to ensure they are in the very best condition for the start of your event. Floor Standing String of Pearl Arch £3.00 per balloon. String of pearl arch with printed latex balloons, and matching clusters of latex and foil heart balloons. To allow us to provide you with an accurate quote, please let us know the height you require your arch to be, and the width required at the base. 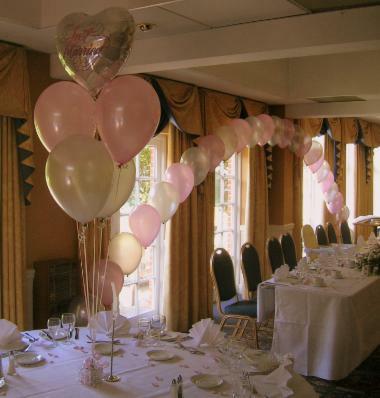 These arches use many more balloons, and work well in larger venues, or outside. The swirling spiral pattern gives the arch movement, and attracts the eye to the focal point. They are most often used to frame doorways and entrances, and over Top Tables in venues with higher ceilings.